To identify important factors affecting men’s decision to undergo prostate-specific antigen (PSA) testing and to determine who is at risk for prostate cancer based on age-specific PSA values. We retrospectively analyzed data obtained from 4963 men aged between 40-80 years. Between 2010 and 2017, participants from rural districts of İzmir, Turkey were invited to join a free public health screening program including brief health history assessment, anthropometric measurements, and blood and urine analyses. Participants completed a questionnaire regarding educational level, marital status, economic status, and previous PSA tests, and venous blood samples were obtained for PSA testing. All 4963 men were included in the study. The majority of the participants had low education level and low or very low socioeconomic status. Nearly all of the subjects stated that their main reason for participating in the screening program was it was a free, regular health check-up program and was easily accessible in their hometown. Urinary complaints were present in 28% of the participants. Of the screened men, PSA level was ≥2 ng/mL in 21.1% and ≥4 ng/mL in 7.7%. Of the subjects with previous PSA tests, 77.5% were referred for either biopsy or further testing, but due to financial and transportation difficulties, only 7% of them followed-up at a hospital or urology department. Economic factors determine men’s attitude towards PSA testing. Specific measures should be taken to overcome factors that hinder the early detection of prostate cancer. Prostate cancer is the second commonest cause of cancer-related death in men worldwide (1,2). Enhanced detection through prostate-specific antigen (PSA) testing mostly explains the increased incidence of prostate cancer over the last 2 decades in many countries (3,4,5). Although PSA testing is not currently recommended as a routine screening tool for prostate cancer (6,7,8), in many countries it is widely performed in primary care, either as a frontline test for men presenting with urinary symptoms or as a free test for men over 40 years at the request of the patient. PSA testing may be influenced by several factors, resulting in a high degree of variability. Healthcare policies, accessibility to healthcare providers, reimbursement, screening policies, and education can be potential barriers to participation in PSA testing and early prostate cancer detection. To date, little is known about the value of PSA and its applicability and practicability for screening in different male populations. Normal and age-specific PSA ranges have not been determined for many different cultures and countries. There are also limited published data on the prevailing knowledge, attitudes, and practices regarding PSA testing in different countries (9,10). More data are needed to identify factors associated with PSA testing in elderly men and estimate the size of the population at risk of prostate cancer who are not tested. The present study aimed to identify the salient factors that influenced men’s decision to undergo PSA testing and to determine who are at risk of prostate cancer based on age-specific PSA. Our findings may offer insight into the factors influencing these men’s decision to participate in screening and as a result, may help guide the design of effective, culturally sensitive, and relevant interventions aimed at increasing participation in screening, as well as further studies aimed at improving treatment options. Our study is a descriptive cross-sectional population-based study. We analyzed data obtained from 4963 men aged 40-80 years from rural districts within the province of İzmir, Turkey who volunteered to participate in a health screening program. The study was designed to assess the health and socioeconomic status of elderly individuals in those districts through the İzmir Metropolitan Municipality public health screening program conducted from 2010 to 2017. Invitations were sent via the news media and local authorities. A free health screening, including for non-communicable diseases like diabetes and hypertension, was performed. The health screening was based primarily on a standardized questionnaire with elements of a brief health history assessment, blood pressure and anthropometric measurements, and analysis of selected blood and urine parameters. Prostate screening was done on-site using a venous blood sample and qualitative screening kits using a cut-off value of 4 ng/mL. Patients with PSA >4 ng/mL and urinary symptoms were referred to the hospital for follow-up. The study questionnaire included items such as previous PSA testing, lower urinary tract symptoms, and past medical history. Factors that may be potential determinants of PSA testing (education level, marital status, and economic status) were also noted. Further information was obtained on the basis of hospital medical records held by the participants. The data were subjected to simple statistical analysis. Because the study was designed as a retrospective chart review, ethics committee approval and informed consent were not obtained. However, the participants provided informed consent during the health screening. All 4963 men who consented to the health screening were included in the study. PSA testing was carried out in all of them. Table 1 shows demographic characteristics of the study participants. The majority of the respondents were married (70.6%) and had a secondary or lower level of education (78%). Most of the screening population invited for the free health screening program had low or very low socioeconomic status. The participants were asked about factors that motivated them to participate in this health program. Nearly all reported that their main reason was that it was a free, regular health check-up program and was easily accessible in their own hometown. Twenty-eight percent of the participants had urinary complaints. Other less common reasons for participation were aging and growing concerns about general health and the prostate. Serum PSA had been previously tested in 544 of the participants. Of these, 77.5% were referred for either biopsy or further testing, but only 7% of them presented to a hospital or urology department for follow-up due to reasons such as cost and lack of access to healthcare. Respondents over 50 years old who had never been tested for prostate cancer cited various reasons for this, including not knowing about PSA testing, never being advised by their physicians to have PSA testing, not being able to afford testing, and lack of interest. Of the 4963 men, 1403 stated that symptoms such as frequent urination, incontinence, and pain had prompted them to visit their doctor. Of these, 522 reported that a physician had advised them to undergo a detailed prostate examination. However, most of them had not been examined by urologist. PSA distribution by age groups is shown in Table 2. Of the screened men, 21.1% had PSA ≥2 ng/mL. Only 2.2% of the men aged 40-50 years had PSA over 2 ng/mL. As expected, mean PSA was higher after the age of 60. 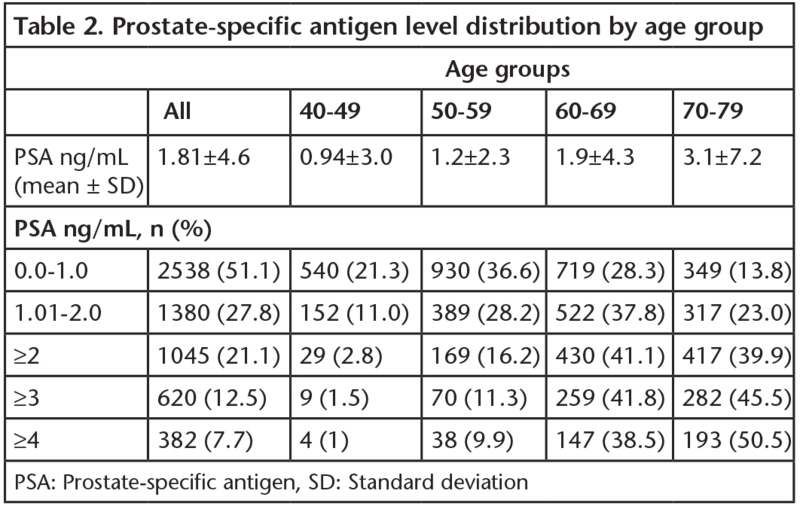 PSA levels were elevated (>4 ng/mL) in 382 of the total 4963 men tested (7.7%), which included 90% of patients over 60 years old. This finding was also evident when using a threshold of PSA >3, which showed a dramatic rise after 60 years old. The results of our general population healthcare screening initiative including 4963 Turkish males demonstrated a 7.7% prevalence of PSA levels ≥4 ng/mL, which is comparable to that reported in other previously unscreened low-incidence community-based populations (11,12). When the European Association of Urology guideline recommendation of PSA <2 ng/mL is considered, by the age 60 the prevalence of high PSA levels increased to 19% (8). Our results clearly show the need for prostate cancer awareness and education programs for the male population. As we have determined that a high percentage of the population is at risk for prostate cancer, more measures to increase screening and access to healthcare should be considered. The present study identified a number of factors that influence men’s decision to undergo prostate cancer screening. Our study shows that some of the participants acted on their doctors’ instructions after they had presented with urinary complaints. A finding which was evident in our study was that symptoms experienced by participants influenced their decision to seek a PSA test. Over a quarter of the participants reported that their symptoms had prompted them to visit their physician, who then referred them to undergo PSA testing. Some of these men stated that they had no previous knowledge of the PSA test and only acted upon their physician’s advice because they sought a solution to their problem. Because most of the participants were undereducated with low economic status, few expressed any views regarding individually requested PSA test. Knowledge about prostate cancer, its risk factors, and PSA testing were all identified as factors influencing men’s motivation to be tested. This suggests that knowledge is very important to the issue of PSA testing because, as with other health issues, when men are informed they can make better decisions. In our study, 89% of the participants had never been tested previously, although they were in the age group recommended for prostate cancer screening. Furthermore, very few of the men who had been tested later presented to a urologist for further testing. The accessibility of testing services also appeared to influence men’s decisions to get tested. Some of the patients said that access to PSA testing was not difficult, which made it easier for them to undergo testing. Most participants indicated that their main reason for undergoing testing was that the health screening program was provided free of charge by the Municipal Public Hospital. Free and easy access as an incentive for early testing indicates lower overall socioeconomic status. Lack of information on where to go for testing also delayed some participants from utilizing testing services, and limited resources to pay for testing was cited as a barrier to early testing. These points were supported by Odedina et al. (13), who argued that access to health care, free screening, and transportation were facilitators of prostate cancer screening. Therefore, our findings underline the need to establish free or affordable testing centers which are accessible to all age groups of men in the community. Interventions for targeted PSA screening among these patients should be considered by those in the health policy field. Limitations of this study are the characteristics of the study sample, which consisted primarily of men who were undereducated and at low socioeconomic status. Hence, the results may not represent men of all socioeconomic groups, and might not include the views of men with better access to testing service and treatment facilities. Nevertheless, this study has provided useful information on important factors influencing men to undergo testing and therefore, highlighted areas to direct health promotional activities in order to increase testing rates. Our study supported much of the existing knowledge on the factors which influence men to undergo testing. Based on the results of this study, economic factors are a major determinant of men’s attitudes towards prostate cancer screening and testing. Several measures should be taken to overcome the barriers hindering participation in early prostate cancer screening. Ethics Committee Approval: Because the study was designed as a retrospective chart review, ethics committee approval was not obtained. Informed Consent: Because the study was designed as a retrospective chart review, ethics committee approval was not obtained, but the participants provided informed consent during the health screening. Ferlay J, Steliarova-Foucher E, Lortet-Tieulent J, et al. Cancer incidence and mortality patterns in Europe: estimates for 40 countries in 2012. Eur J Cancer 2013;49:1374-1403. Jemal A, Siegel R, Xu J, Ward E. Cancer statistics, 2010. CA Cancer J Clin 2010;60:277-300. Center MM, Jemal A, Lortet-Tieulent J, et al. International variation in prostate cancer incidence and mortality rates. Eur Urol 2012;61:1079-1092. Bray F, Lortet-Tieulent J, Ferlay J, et al. Prostate cancer incidence and mortality trends in 37 European countries: an overview. Eur J Cancer 2010;46:3040-3052. Etzioni R, Gulati R, Cooperberg MR, et al. Limitations of basing screening policies on screening trials: The US Preventive Services Task Force and Prostate Cancer Screening. Med Care 2013;51:295-300. Hayes JH, Barry MJ. Screening for prostate cancer with the prostate-specific antigen test: a review of current evidence. JAMA 2014;311:1143-1149. Ilic D, Neuberger MM, Djulbegovic M, Dahm P. Screening for prostate cancer. Cochrane Database Syst Rev 2013:CD004720. Mottet N, Bellmunt J, Bolla M, et al. EAU-ESTRO-SIOG Guidelines on Prostate Cancer. Part 1: Screening, Diagnosis, and Local Treatment with Curative Intent. Eur Urol 2017;71:618-629. Williams N, Hughes LJ, Turner EL, et al. Prostate-specific antigen testing rates remain low in UK general practice: a cross-sectional study in six English cities. BJU Int 2018;108:1402-1408. Steele CB, Miller DS, Maylahn C, et al. 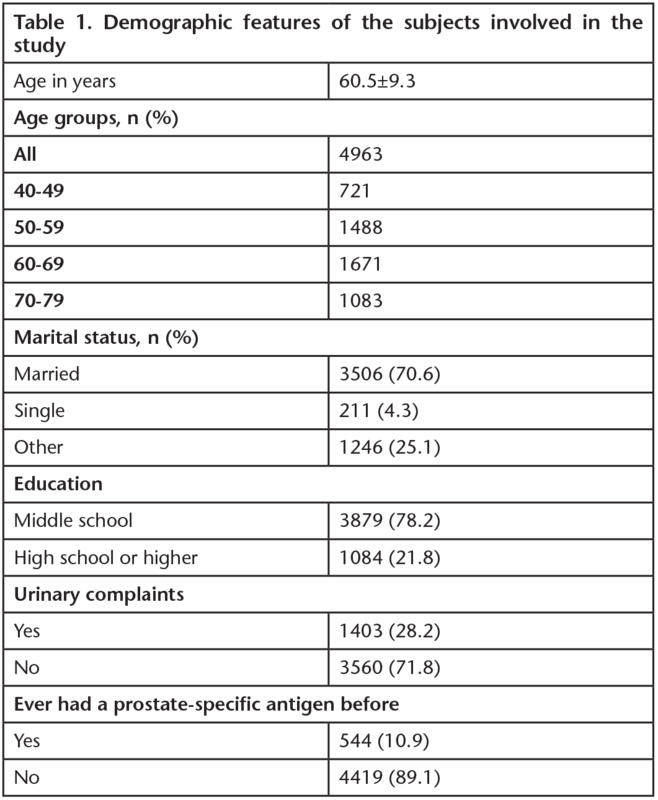 Knowledge, attitudes, and screening practices among older men regarding prostate cancer. Am J Public Health 2000;90:1595-1600. Jalloh M, Zeigler-Johnson C, Sylla-Niang M, et al. A study of PSA values in an unselected sample of Senegalese men. Can J Urol 2008;15:3883-3885. Arafa MA, Farhat KH, Al-Atawi MA, Rabah DM. Prostate cancer screening in a low prevalence population. Is it worth it? Saudi Med J 2017;38:733-737. Odedina FT, Scrivens J, Emanuel A, et al. A focus group study of factors influencing African-American men’s prostate cancer screening behavior. J Natl Med Assoc 2004;96:780-788.